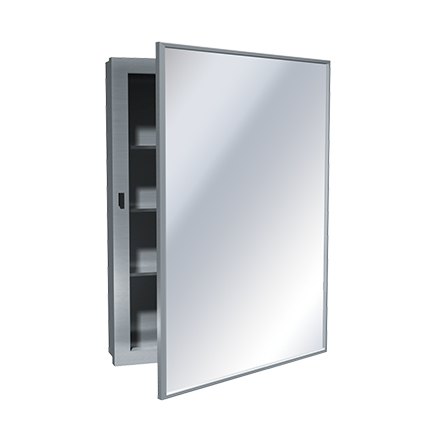 Surface mounted cabinet is made from 20 gauge stainless steel with a satin finish. Mirrored door is hung on cabinet with a full length 3/16″ staked piano hinge. Cabinet has three adjustable stainless steel shelves. Access is gained to the three (3) adjustable shelves by disengaging magnetic catch and swinging open the door. Adjustable shelves permit storing various size articles.